If there is one thing I have learned in life is that love is complicated. My training in theology and my study of the scripture has always led me to understand that love stands at the center of all things as the defining characteristic of who God is, and yet this profound mystery can also be the word of choice when we are describing our desire for food… I love West Carolina BBQ.. just kidding. What do we mean when we say we love something? In a certain sense, when we meditate on the various meanings and applications of this most basic of concepts, we start to grasp an image the early Christian theologians used to describe how we move towards God and are transformed by his grace. These theologians talked about a ladder of divine ascent, and if we think of love in this regard, we can place our love for things at the bottom of the ladder and the love of God at the top. In between, there is the complexity of human life and the various relationships and “loves” which occupy our existence in this world. Just above the love of food, we could talk about a love of honor, a love of accomplishments. Maybe then we could talk about our love of health, our desire for security. In this way we create a hierarchy moving from earthly things to spiritual things. Within this context, we can also understand that the path to hell begins with love. Let me say that again, the path to hell begins with love, or rather a distorted love in which we take some aspect of that ladder and instead of allowing it to move us to the love of God, we turn that part of creation into our god. Someone might say, all you need is love… but what if you love violence? What if you love money? What if you love your boyfriend or girlfriend so much that you sell your soul to the devil by committing mortal sin to please them? What if your love of pleasure so clouds your thinking about your boyfriend and girlfriend that you fail to see how they are leading you astray? The journey towards God is about overcoming sin so that our love can be purged, illuminated, and united to the love of God. Within this context, we must be diligent in examining our hearts and seeking to rid ourselves of even the smallest attachments that keep us from divine love. I propose that one of the most important meditations that we can engage in to stretch our capacity to love is the meditation on God’s mercy. 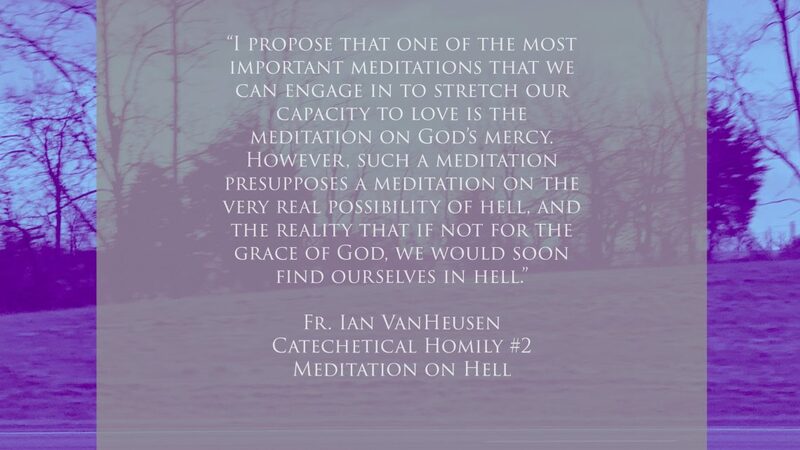 However, such a meditation presupposes a meditation on the very real possibility of hell, and the reality that if not for the grace of God, we would soon find ourselves in hell. The tradition teaches that there are two primary motives for repentance, the fear of going to hell and the love of God. Some erroneously think that you can ignore the fear of going to hell, and just focus on the love of God as the main motive for conversion. I believe this is a big mistake. While it is true that the love of God is superior to the fear of going to hell, I believe a holistic spirituality will recognize that the two are interconnected. Meditating on hell and the reality of the divine punishment for sin is precisely the pathway to recognizing God’s mercy in our life. Yes, for some folks who struggle with various forms of mental illness, such a meditation may be too overwhelming, but I would argue for a soul that possesses the courage and strength to go deeper, this meditation is a necessary means of connecting with God’s mercy. Remember what the Church teaches on sin. There are mortal and venial sins. Mortal sins break our relationship with God. One teaching that needs to be reaffirmed in the minds of the faithful is that one cannot receive communion if one is conscience of mortal sin and has not properly confessed it. For example, many Catholics think nothing of breaking their obligation to attend Sunday Mass or a Holy Day of Obligation and then present themselves for communion without the least concern for the sacrilege their committing and the scandal they are causing, especially to the young. Furthermore, there is not the least concern that when one embraces a sin which is grave matter with full knowledge and full consent, i.e. they have committed a mortal sin, the consequence of such an action is going to hell. We have told our kids over and over again that God loves them, but when we have failed to teach a proper hatred for sin, a fear of hell, and importance of Divine Justice, we have replaced the truth with a placebo that seems more like a cheesy movie than the understanding that scripture gives us. Yes, God loves us, but God also punishes sin. There is a consequence for our sins, and I believe most people understand this. The problem becomes that we often look at our sins as being insignificant and we think more highly of ourselves than we ought. But the mercy of God is that when we have true sorrow for sins and practice repentance, our Lord comes to us and forgives us. No one will be able to receive God’s mercy if they don’t understand first that they need to be forgiven… that we are all sinners in need of pardon and forgiveness. I believe there are two fundamental realities that are profoundly interconnected. I believe that the more we are able to understand the reality of hell, and how we would soon find ourselves in hell if not for the grace of God, we would then be open to God’s mercy and this in turn would profoundly and radically deepen and transform our love. The more I am able to understand that I am forgiven and I truly receive this knowledge with joy and thanksgiving, the more I will learn to be patient with the faults of others, the more I will learn to find peace in the midst of chaos, the more I will be able to move through the sufferings of this world with the knowledge of a salvation that lies just beyond the horizon. I think of the literary classic Dante’s Divine Comedy where the author moves from Hell to Purgatory to Heaven. So many of us want heaven, but we are not willing to enter in the darkness of how sin has infiltrated our hearts. I believe that the more we are able to enter into and fight the darkness that is within, the more we will be able to love. By stages and degrees, we will encounter the deep roots of sin in the human heart and this will deepen our understanding of God’s mercy. But meditating upon the reality of hell goes beyond simply my own salvation and transformation in Christ. It informs how we engage in the mission. We often recognize that we would be lost if it were not for our Savior Jesus Christ. Jesus is my personal Lord and Savior, yes… but what has he saved you from? Certainly a life full of confusion and heartache… in a certain sense… but a repentance based solely on mental health and positive thinking, while of some merit and some value in educating the young, is incomplete. Jesus doesn’t just save us from having a bad life, but rather he saves us from the deeper reality of hell. I am not sure that we need to make this the central feature of our education of the young, but we must cultivate at least an understanding that hell is real and that we will be judged according to an objective standard. I haven’t reviewed our faith formation, so I can’t say that such a discussion is completely absent from our program, but if it is, this needs to be remedied as soon as possible. What has Christ saved us from if not hell? More important, what does the message of a savior mean to a culture that is neither concerned with hell nor particularly worried about it as a possible outcome? When our young people fall away from the faith, the reality is not simply that they have stopped going to Church and that there lives would be better if they went to Church… the reality is that they are putting their eternal souls in jeopardy. Along these lines, evangelization is not simply about increasing Church membership for the sake of having a thriving parish, but it’s about saving souls. Yes, God’s mercy is such that his grace sometimes works outside of set patterns and the visible structures of the Church… and such teaching lead us to appreciate the importance of mystery when gazing upon particular circumstances. That being said, we should never presume that someone is going to heaven, and our active efforts should be to facilitate conversion and unity with the Catholic Church. Our mission is the salvation of souls… the salvation of souls that would otherwise face damnation. But all of this should not lead us to despair or be the cause of bad mental health. It is precisely the devout soul that sees this reality and cultivates hope. In fact, when properly understood, such a meditation purifies hope and gives it its proper orientation. Such a hope cultivates in us the desire and the necessity of prayer. It leads us to believe that our urgent prayers will be heard. It leads to a hope in which we recognize that when we pray for the conversion of sinners, such a prayer is efficacious and powerful. It nourishes a hope that helps to understand that we can work to be a tool of reconciliation for souls that have gone astray. A hope that is deeper than wishful thinking because it is animated by a recognition of God’s mercy in our own lives and a desire to share that with the world. This is the path of a disciple of Jesus Christ… this is the path of the saints. Amen.